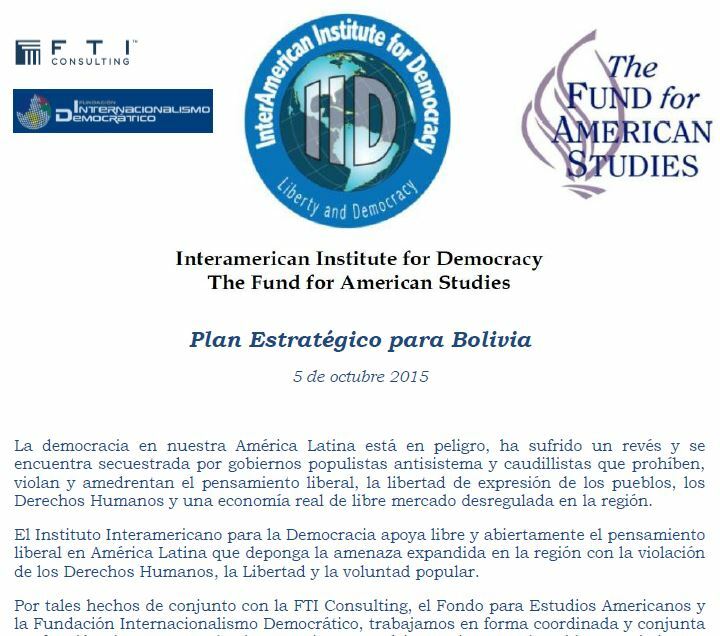 Washington-USA-AGPROG(18-11-2015).- The document entitled “Strategic Plan for Bolivia,” was prepared by the IID American Institute for Democracy, Democratic Internationalism Foundation, with the sponsorship of the Fund for American Studies and US consulting firm FTI Consulting. 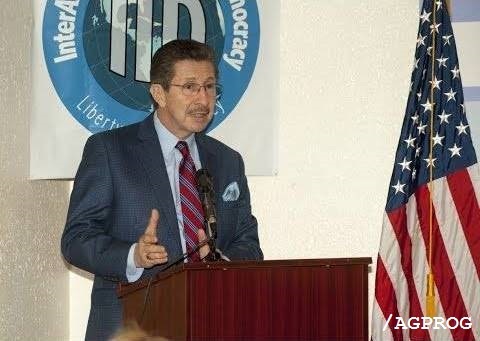 His time of writing as shown in the document was the October 5, 2015, during a meeting some representatives of these three organizations, including Carlos Alberto Montaner IID director, chief delegates of the Bolivian opposition leaders, US senators conservative as Ileana Ros -Lehtinen member of the House of Representatives and in charge of the Agency for International Development (USAID) for Latin America. 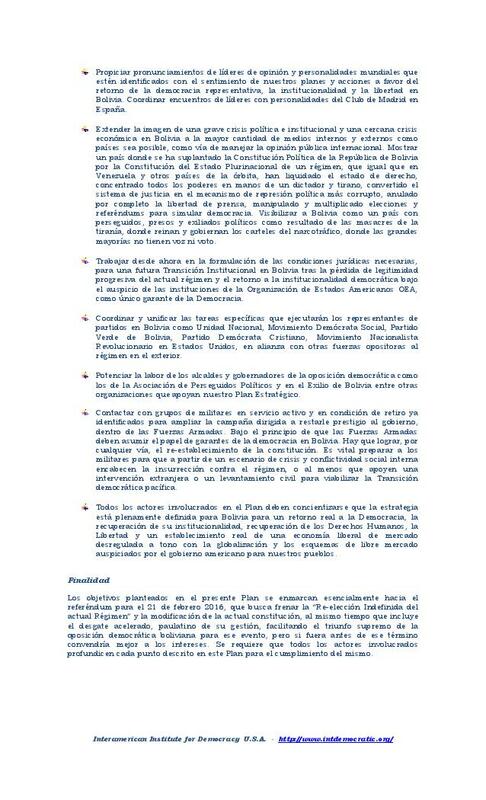 The strategic plan to destabilize the Bolivian nation has the main aim of weakening the Government in the forthcoming democratic referendum next February 21, 2016, as detailed in the document text: “The objectives in this Plan essentially they fall into the consultation, which seeks to curb the “Indefinite Re-election of the current regime” and the modification of the current constitution, while including accelerated desgate, gradual their management, providing the ultimate triumph of the democratic opposition Bolivia for that event, but if before that term should best interests. It requires that all stakeholders deepen each point described in this Plan for compliance. “. The referendum is planned for this February and has proposed to ask the Bolivian people if it agrees to the amendment of the Constitution to again allow the candidacy of the current President of Bolivia and his vice president in future Bolivian democratic elections in 2020, as It is democratically allowed in other advanced countries like Russia, Germany, Belarus in the European area. 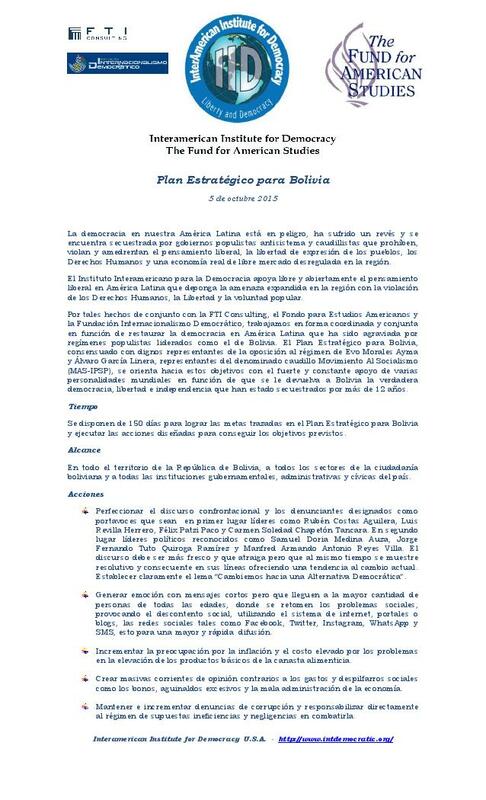 The strategic plan of destabilization that comes to light also details the strategy to project an image of crisis in Bolivia internationally. As part of the plan, the authors propose cause discontent, using certain weaknesses of the government and resulting in a negative perception of the government. 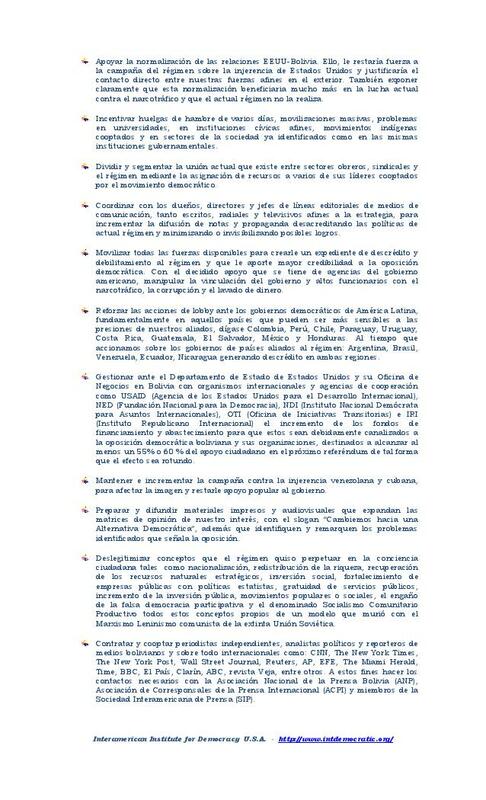 This document evidence and confirms the veracity and seriousness of the allegations made by President Evo Morales and the real intentions of the right sectors of neoconservatives in Bolivia. Bolivia is under continuous attack, as it has been in recent years since the start of the Bolivian Revolution and the recovery of sovereignty, independence and dignity of the country. Every time the US administration strategies are clearer about not only Bolivia but all the countries of ALBA and CELAC in South America and the Caribbean, in the direction of trying to restore the old neoliberal model that blight Latin America, through privatization and looting of natural resources, for it is now worth agencies, methods and agents to run interventionist and subversive activities. Various methods used to drill revolutions often fragile or run called tapping operations. Given this it is necessary that the revolutionary social sectors to remain strong and firm, confront the lies and psychological operations created with the word of truth above all.